Can you remember how excited you were in the younger grades to get to school on Valentine's Day? You spent so much time carefully printing out a card to each person in your class (even the boys!) and you could hardly wait till it was time to deliver these to the mailbags decorated in paper lace doilies and red construction paper hearts. You actually counted how many you got and then sorted them out into piles of similar designs. Then, if you were lucky, the teacher handed out some of those small red cinnamon heart candies! In what grade was giving valentines no longer cool? Did we get them from our siblings and parents? Then, there was that dread you felt in High School wondering if that dippy boy who was always looking at you in Gr. 10 geography would actually give you a yucky card! It was in inevitably the mushiest card at the stores! Ick! And for me, he's the ideal mate! He's the best friend that I'll ever find. He'd do anything for me that he could. And I know that you'll always be there. How sweet! Mr. MOI is a very lucky man. That is so sweet! He'll love it, I'm sure! I went all out for my students this year. They're getting LOADS of chocolate... But gosh- I knew I was forgetting something! ... I didn't get the red cinnamon hearts. Darn! I loved those candy hearts. Like most things, I never quite understood it. I only recall giving out cards once - in grade 2 or 3. Your hubby is a lucky guy. Happy Valentines Day to you both. Valentines - not cool starting 5th grade (age 10) at least amongst my children..........I just always dreaded getting the really ugly ones in my box.........!!! Happy Heart Day back to you! Pauline: Thanks, he deserves it! Bob: Thank you...but I'm pretty lucky too! Gr: Yeah....sappy eh? So out of character for me! Abigail: And like any good teacher should, you'll gett'em high on sweets, and then just send'em home! Meno: Thanks! Me too, and to think they'll all be 1/2 price tomorrow! Richard: You're funny! And do you understand it now? Do you buy into the commercialism and buy your wife something? Cook some special seafood??!!! Coll: Thanks..but I think I'm pretty lucky too! Annelisa; Aw...you should have come here where we make a big commercial deal about everything! HA! It is highly over-rated ...but it was fun when I was little and you know how much I loved sweets! 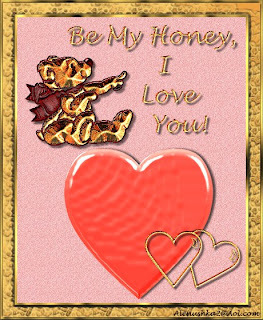 My 1st Valentine from a boy was from a drippy guy I dated at 18,,,it was mushy and serious and yucky!!!! I decided then that I didn't want one at all unless it was cool and from someone I really liked a lot! I was so picky! I didn't have a steady boyfriend until I was 21! Then met Dave when I was 22! I was a very late bloomer! Hey, I hadn't checked You-Tube for a few days! Neat! RDG: I'm honoured to be the first! oh, i loved v-day cards at school. it was so much fun! What sweet words! Happy Valentine's Day. I'd rather be in Japan. You know I never liked those candies. But I loved the doilies. Me, the non-girly no pink girl. Poor Colin has been sick all week and has missed his class Valentine's Day party. I'm sure he'll get his box of classmate valentines (tomorrow?) but it's not the same as getting them and laughing over the jokes with your friends. Becky: Oh, to be in Gr. 2 again! Paul: Aw man! How'd they manage that?!! Maggie: Thanks! Kids now like colouring those doilies with markers! How could you not love those candies if only to make red lipstick on your lips?!!! Diana: Thanks. Aw, poor Colin. That's hardly fair. I've been absent as a teacher but not as a kid. Sweet! My husband sent me my first-ever Valentine's Day post. Our two Davids are pretty special, don't you think? Hi there! Thanks for leaving the thoughtful comment. Barbara: I think that is so cool! Kinda wish my husband would post but he's even slower than I am so I'd get it late every time..maybe for next year! Nancy Dancehall: Thanks! Yep I did! After making valentines, I liked the ones that cost ten cents for 25 and you could make stand-ups out of some. Old Lady: I remember those! Great fun! I think I bought Flintstone cards once! Renny: Thanks...yes. we're a pretty together couple and are both very lucky to have found each other quite early in life. Still, it doesn't do your ego any good to get a seriously mushy, yukky card, now does it!! Annelisa: NOT! He's still a dipstick! Nice guy, though. Yes, it's not really needed except the flower shops and Candy Shops take advantage of pushing it and so many buy into it! AL: Yeah, I just chose not to live with one....wait maybe someone out there is thinking my husband is a dipstick?? "Dippiness is in the eye of the beholder"! Garden plants is a great idea! Here we can't buy those at this time of year though.